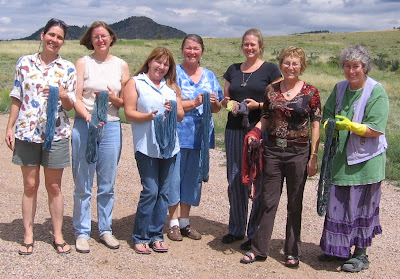 Last weekend, I participated in a Natural Dyeing Class at Eye Dazzler Alpacas and goodness gracious, I had a ball! On the first day, we learned about dyeing with Cutch, Madder, Osage orange, Logwood, Brasilwood, Weld, and Cochineal. Above, you see my lovely teacher, Liesel Orend, decanting our Cochineal dye. Double, double, toil and trouble... Here you see the backs of Robin, Beth, Marianne, and Liesel, and the front of Molly, and if you look carefully, you'll see Allie... Oh, this was more fun than you might imagine! Molly pointed out how all of the natural dyes match, and here you can see that she is right! The next day, we learned about indigo dyeing. In the photo above, Marianne has just removed one of the day-glow-yellow Osage Orange skeins from the indigo pot, and it is quickly turning green. The magic of indigo is that it doesn't come out of the pot dyed blue, it turns blue right before your eyes. It is totally cool! Here are the skeins, with only the dyes. We started with two different colors of alpaca yarn, white and fawn - the white skeins are on the bottom and the fawn on the top. They are so pretty! I can't get enough of them! Left to right - Osage Orange, Cutch, Cochineal, Weld, Logwood, Madder, Brasilwood. Imagine how insufferable I'll be with photos of the grandchildren? lol. 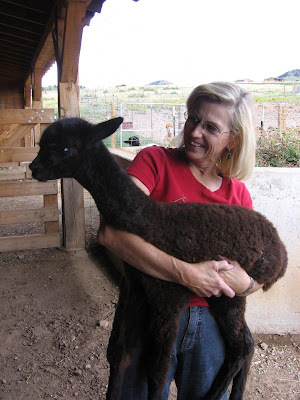 Contact Allie at Eye Dazzler Alpacas if you would like to know more about her fiber school. There are lots of different classes - dyeing, spinning, knitting, felting, needle felting and others - and they are very much fun! All classes are held at the ranch in Westcliffe, and they nearly always include a scrumptious lunch prepared by Allie. After a couple of days of dyeing, we visited the source of the fiber - the alpacas! Allie is holding the first baby of Eye Dazzler Alpaca 2007 Cria Season. I think that they named him Cowboy. Isn't he darling? What a great way to spend a couple of days! I really had a blast. I'm so glad you posted this. I am thinking about taking the next "Meet the Fleece" class. Your yarn colors are very pretty. I think one reason they complement each other so well is that they are all the same 'weight', or intensity. Ooooh! Looks like you had LOTS of fun! This looks fantastic! Can you tell me - were you working with raw plant/insect material or with natural dye extracts? The colors you got are fantastic, and it's especially neat to see how they come out on the different colors of yarn. 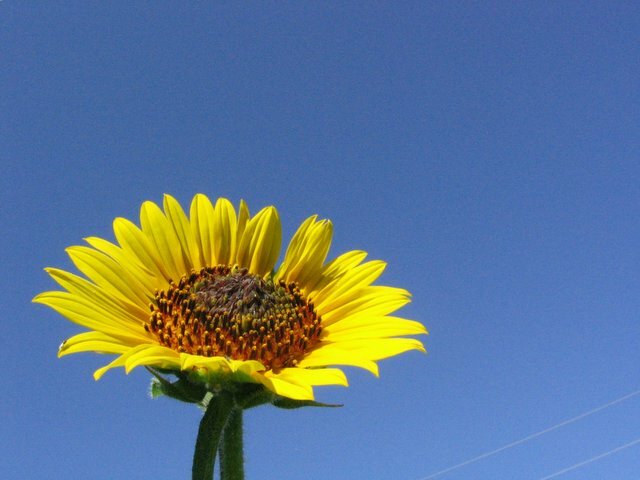 Thank you for posting about the workshop in such detail! Hi evergreenknits, yes, we used raw materials. For the cochineal, we used dried bugs, which we boiled for a while then ran through a fine seive. The Weld was fresh, green material which Leisl grew in her garden. The other stuff was dried and ground or chipped by the supplier - one of the dyestuffs looked like sawdust which I sweep up off of my woodworking shop. Gotta start saving that stuff and boiling it, eh? It was a wonderfully fun class, and Allie is offering it again, so check out eyedazzleralpacas.com for more information, should you want to take the class. It was really informative and terrifically "hands on" as you can see from the photos. wow...i sat here at my PC to watch a movie, and this is what i found, something much more interesting. Sock yarn - self striping!